Yeah we go again, embarking on another fun filled week at work, although this will be only a three day week for myself with the 4th of July on Friday and me taking off Thursday to take my Mom home from her Doctors appointment. It may be a short week for me in days working, but trust me I'll be busy preparing for the big Pic Nic this coming Sunday. Last week they had to temporarily move me from my office to a temporary one in another building, it was a nice office, but I only took one Computer (I have three) and a 30" Monitor (I use 3 24" Monitors running dual monitors on all three machines) and I'm ready to get back to my office. It was a nice change, but there is nothing like home sweet home especially since they just replaced the entire HVAC system in my building and office. It looks like the weather is going to be awesome this weekend, but it's still early and that can always change. I would love to see great weather for the Pic Nic, it seems like it was just yesterday I reserved it, but that was April 8th. It's nice to see people finally communicating for this, something tells me this is going to be a very memorable day. I hope to grab as many pictures as I can and hopefully my very creative niece Amy will bring her camera and we can get a very creative photographer (she needs to do this for a living) taking some pictures. I would like to take this opportunity to wish my step-son Chad Collins a very Happy Birthday today. I've watched Chad really mature the past few years since Michelle and I have been together. He will be entering his Sophomore year at Fairmont State this fall. To get a picture of Chad, one has to be both creative and sneaky because he rarely allows for his picture to be taken. Even when you think you have the upper hand, he always seems to have the last movement just as you are pressing the shutter to take the picture. Not sure what Chad and Laiah's plans are today, I know that they are planning a trip to Myrtle Beach in August before school starts. Here I sit once again on a quiet Sunday Morning, I'm the first one to recover from that knock out by the Sandman last night and I'm up early watching something on HBO (not paying attention) and collecting my thoughts as I surf the information superhighway. We had a great day yesterday at the Rosiak annual pic nic, of course I participated in the annual water battle with my Super Soaker, Miss Layla made sure there was not a dry spot on me as a couple other did as well. Old man or not, I still participate in this every year with the kids, mainly because I'm still a big kid at heart. Today is going to be our normal routine, shopping laundry and chores. Nothing too overly exciting other than maybe working a nap in. We had a very active and productive day yesterday that included spending about 1 1/4 hours down on the rails to trails. We walked from the Greer Building to downtown at the end of the Caperton Trail and back. I have a foot that has been sore and I definitely felt it when we got done ans even more so this morning. Gearing up for a short work week ahead, I'm only working three days this week, so I have a nice four day weekend to look forward to including our big family Pic Nic at Krepps Park. It's that time of the year again, that once constant that has been a part of my life since 1998 when I attended my very first one. It's the annual Rosiak Family 4th of July Pic Nic and water battle. That time of the year when I bring out my large 1990's version Super Soaker that you can't seem to even find anymore and prepare to enter the Di-Hydrogen Monoxide Battle for the ages. I did buy something that we have needed last night, I ordered a Sewing Machine from Wal-Mart. Nothing too fancy, we are mainly going to use it to repair clothing when it needs it, I have a bad problem with breaking belt loops in my Levi's, and when you are losing weight that could present itself as a problem on occasion. Hayley has one, but it's sitting back in a closet somewhere, but there are problems with that one, so I went and got one that could better fit our needs. It's already in (saved money ordering from the website and shipping it to the store) and we will pick it up this morning. We looked around at a few places yesterday as research, and this was the one Michelle liked. It's calling for nice weather today, so get our and enjoy yourself, and live life to the fullest on this day. It is once again that point of the summer that I always look forward to, it's time for me to once again dust off my monster super soaker and prepare for the Summer water battle at the Rosiak family 4th of July Pic Nic. I think this will be my 16th consecutive year of going to this event, you could say I watched Arron grow from a young 3 year old little boy to the mountain of a man that he is today. Hopefully the weather will be cooperative with us this weekend, it looks right now like Mother Nature may be nice to us and give us some semi decent weather. Our day today is going to be a normal Friday, after work Michelle and I will go out to dinner as we do every Friday afternoon and then head to Sam's Club to stock up on what ever bulk items that we may need. That is usually followed by a nice relaxing evening at home and possibly planning of the next weeks menu. What a great way to start a weekend. 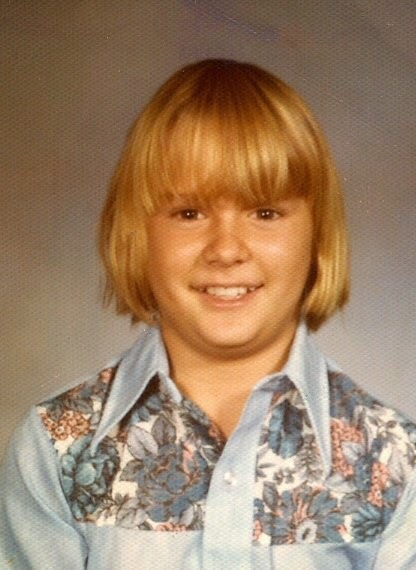 This weeks picture goes way back back to the days when I was in Junior High School and actually had hair. Yes my days of being a long haired hippy were winding down in the mid 70's, as seen here by my 7th Grade School picture for our yearbook. This puts this picture either in the fall of 1976 or the spring of 1977, or the "Elvis is Alive" era. I actually had someone ask me if I was alive when Elvis was during my Freshman year of College. You have to absolutely love that Western motif shirt that I wore that day, I have no idea why I wore that shirt that day, but it was one of those pictures that were forever captured and you can not change. I was a very hot looking guy back then, even if I do have to say so myself. 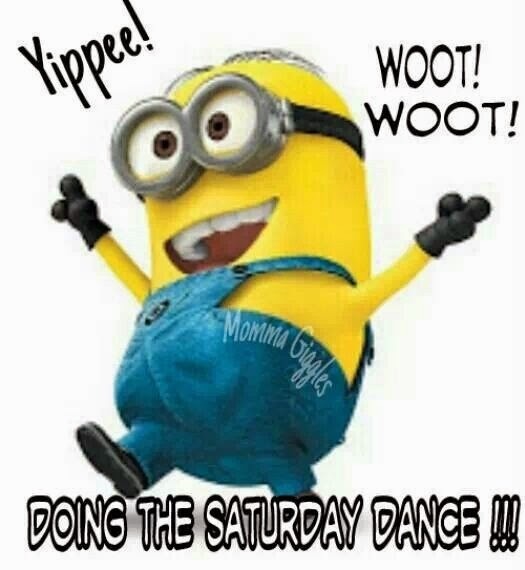 Well that is two days down, two more days ahead of us, now all we have to do is get past lunch time today and we are then well past that halfway point of working towards another fun filled weekend. I've kind of hit a stalemate in weight loss the past few days, but don't fret, we're still at it and the numbers are working in my favor. Still have a long ways to go, but I've finally hit that plateau where you have trouble breaking. I'm still chugging along and no one said this was a quick and easy journey because it was not a quick one to put it on. Michelle and I finished watching season two of Orange is the New Black, I'll be honest with you it was a little slow developing the story line this season, but it still delivered and delivered in a way that brings you out of your seat. Now it's just a waiting game until the next season of House of Cards or Orange is the New Black (which I think is already filmed) as to which one will come out first. That's OK, we have a Summer and a Football Season before we have to worry about it. * Well that dreaded Monday is now once again behind us and we have got this work week kick started in style. Ready for a tidbits? * I moved offices yesterday. I'm temporarily in another location until they are finished changing the air conditioning ventilation in my office. * It has been 3,961 days since yours truly received his degree from West Virginia University. * 2,292 days ago Michelle and I went out on our first date. We had known each other for years, but we were reconnecting and this was our first official date. * 1,516 days ago I pretended to surprise Michelle with proposing marriage, she had already knew no there really was no surprise. * 1,053 days ago in front of our closest family and friends,we made it official and tied the knot. * I have 6,369 days to go until I retire, give or take a few hundred here or there. * Only 190 days left in 2014 and my Goodbye 2014 Blog. * If you want an early start on your Christmas shopping, there are still 184 more shopping days to go. We're about to hit the half a year point. * 75 more days until we head to the Caribbean once again on our third cruise. We have taken the Carnival Pride each year and it will be a new remodeled boat next year. * 43 more days to go until our third wedding anniversary. * There are only 29 days to go until the Parrot Heads in Pittsburgh re-unite for our annual meeting with Jimmy Buffett and the Coral reefer Band. * We are 12 days away from the Pic Nic at Krepps Park. Things are now starting to come together and people are communicating. This is going to be an awesome day!!! * This is my 3,687th blog post that I have written for Georges Journal. That is an entire decade of averaging one post a day, I can't believe that I continued to do this for so long. I usually lose interest and move on to something else, but it hasn't been the case with this. * Hayley is in Petersburg for the week. Her friend came back from the Marines and they are there celebrating. She'll be back by the first, that is when her and Josh move into her new apartment by Morgantown High. She was going to take her dog Gracie with her this week, but we're continuing to dog until she moves out officially. * I see my niece Amy is excited. She booked her vacation yesterday. They are going to go to Ocean City this week and taking the kids for a few days. They are going down to celebrate their wedding anniversary and birthdays for the kids. I told her to have a great time, and I wish I was going with them. * I did get a brief chance to speak to my brother Gary yesterday. We spoke about the upcoming Pic Nic and the Buffett Concert. I am pretty sure he's going to bring my niece Val along for the concert, should be a great time indoctrinating a new Parrot Head. * The annual Rosiak 4th of July Party is this weekend. I've lost count on how many I have been to through the years. Every year since 1998 I have attended this annual event with my giant antique Super Soaker. Well all good things must come to an end and that includes our fun filled weekends that we enjoy so much. Now it's time to stick our noses back to the grindstone for another fun filled week of work and work towards yet another weekend. 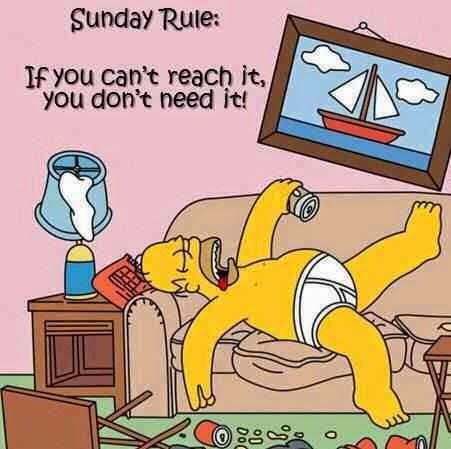 I love weekends, but they would not be any where near as fun if we didn't have that dreadful Monday morning. I'll be moving offices today, it's supposed to just be a temporary move as they are replacing all the over head air conditioning duct work in my office this week. I should be back in my regular office next week hopefully. I love the office that I have now and would hate to lose it, but you never know, anything could happen. Looking at the week ahead I have no Doctors appointments this week, considering that I have had quite a few with multiple Doctors in the past few weeks, that is an accomplishment..LOL I have met with a Surgeon, a dietitian and a substitute for my regular doctor as well as a follow up with one of his other team members due to some high test results (they are fine now). I could have probably went to Urgent Care yesterday morning as I basically sliced the top of my thumb while cutting peppers for breakfast yesterday morning. We have a great sharp Santoku knife that I used to cut up vegetables that I just slipped on a little. Nurse Michelle patched me up and I'm good to go. No reason to do a cranial amputation. Here I sit once again on again in a quiet household. I am once again the first to recover from a dreadful losing battle with the Sandman and am up watching The Doors on some movie channel. Michelle is still fast asleep as she managed to get an upset stomach yesterday afternoon. Rocky and Lilly, our house guests for the week have returned home as Michael and Ashley have returned from the beach. We did a little bit of experimenting with food yesterday. As you may have noticed Michelle and I are both having a lifestyle change with our eating habits. I have been too big for too many years and it is time to take drastic measures to increase our quality of life and extend them both. I'm on a diet that is almost half of my needed caloric intake to maintain my weight. My weight was at it's highest it has ever been around Christmas and I knew changes were coming including insulin to control my diabetes that had gotten out of control. Since Christmas I have lost 41 pounds and about 25 pounds since we first met with our dietitian just a few short weeks ago. Long way to go still but this is not as hard as you would think. Loseit.com is awesome and they have an app for my iPhone as well. Today we will be doing our grocery shopping and laundry as we do on any normal Sunday. Our weeks menu has been planned out since Friday (we use an app called Evernote) to communicate our menu with as we prepare for the week ahead. We have actually used that app for about a year now, great to sync work notes and about anything you want to keep track of. Highly recommended and useful app for those of us who like to keep track of everything. I hope everyone has a great day and that the weather is more cooperative than yesterday (we got caught out on the trails when it started to rain). Michelle is up so it is time to start breakfast and get this day started. Here I sit once again in a quiet household, everyone (Michelle) is still asleep after suffering a defeating battle with that dreaded Sandman last night. Hayley is up in Waynesburg with her boyfriend for the weekend helping him pack up for their move on July 1st and I'm up watching 40 Year Old Virgin on HBO. No plans for the day as of yet, it's supposed to rain this morning so maybe we can get out this afternoon and do something if it's still raining when we usually go and walk. I guess we have to give Mother Nature the benefit of the doubt after the past two weekends that we had. I do need to start to get organized for the Family Pic Nic. If you are reading this and plan on attending, please let us know so that we can get a head count and can plan accordingly. Hopefully it will be a nice day, but even if it is not we have the shelter right beside the pool reserved. Admission to the Pool is $6.00 for Adults and $5.00 for kids 3-17. Under 3 is free with an adult. Have a great day, maybe we will get lucky with some nice sunshine today. I would love to get out and around rather than being stuck at home, since today is the FIRST DAY OF SUMMER!!!!! 151 years ago today on June 20, 1863 the state that I call home said screw you we're out of here to the state of Virginia and formed our own state. 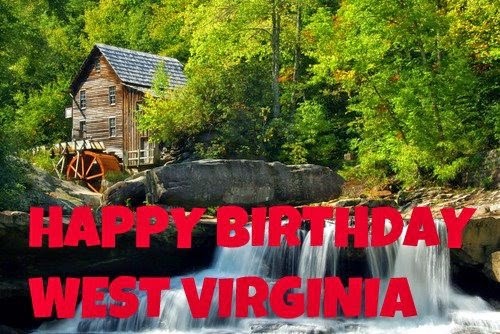 Happy Birthday to the state that I love so much and call home. Are you looking for something to do this weekend? Join the club, so are we. It looks like Mother Natures streak of being nice will come to a halt this weekend, but you never know. Maybe she'll pop out some sunshine and we can enjoy the beautiful weather. Wishful thinking? Maybe, but it's always nice to dream a little. If you are looking for something neat and interesting to do, Touring Morgantown is a great website with a calender of events for things going on in and around Morgantown each day. It's a nice little site that is more than worth a bookmark. 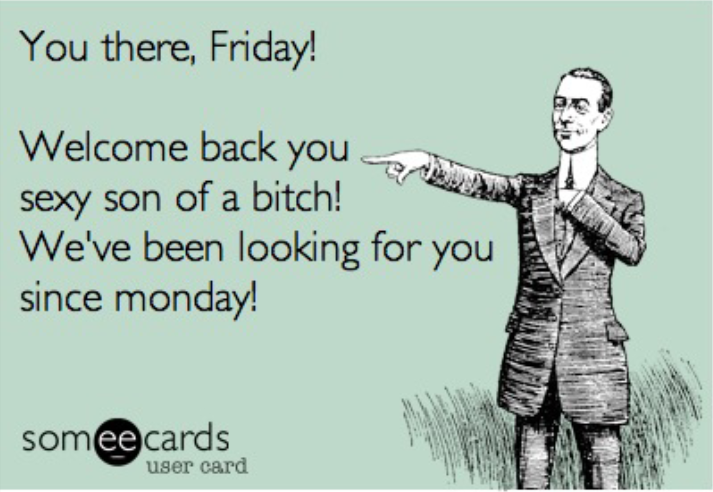 Have a great Friday and lets get this party started. I would like to take this opportunity out to wish my Great Niece Erica Jean Nicholson a very Happy Birthday today. I'm not sure what she will be doing today, being that she is on Summer break from school. I know that she and her brother Josh have been enjoying the pool all summer long, and with weather permitting I'm sure she will be in it once again today. We had her birthday party a couple of weeks ago at here home as you can tell by the picture. They had spent the day in the pool and they were quite anxious to get back into it. If you see Erica Jean on this day, make sure that you take a little bit of time out and wish her a very Happy Birthday today. Once a week I like to take a little bit of time out and look through all the pictures that I have either taken, scanned or stolen off the internet through the years. Little precious lost moments in time that are briefly brought back to life in my blog for a day. Sometimes this is is a pretty easy task to find that one special picture and sometimes it is not so easy. It is however always a whole lot of fun. This weeks picture was actually a pretty easy one for me. As many people know my parents divorced when I was a child and the three of us all lived in different households. My Dad remarried and had two more kids and my Sister Terri moved in with my Mom, my other sister was raised in Pennsylvania by my Mothers Mom and I was raised by my Father Parents. This was my Grandmother that raised me. I have often spoke of my Grandfather on this blog and his music and legacy, but rarely do I post about the one person who was the most influential in my life. 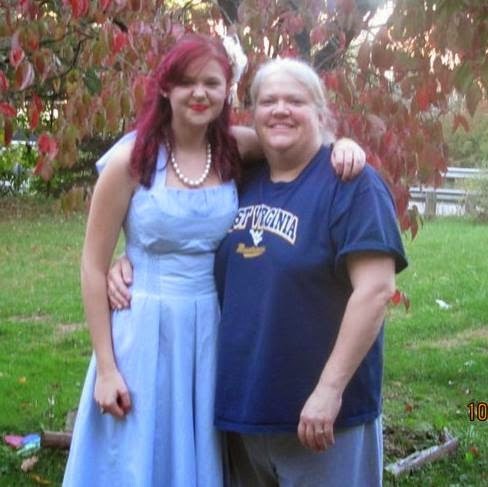 This was the woman who raised me from my earliest memories until the time that Lung Cancer had taken her away from us when I was still only 16. 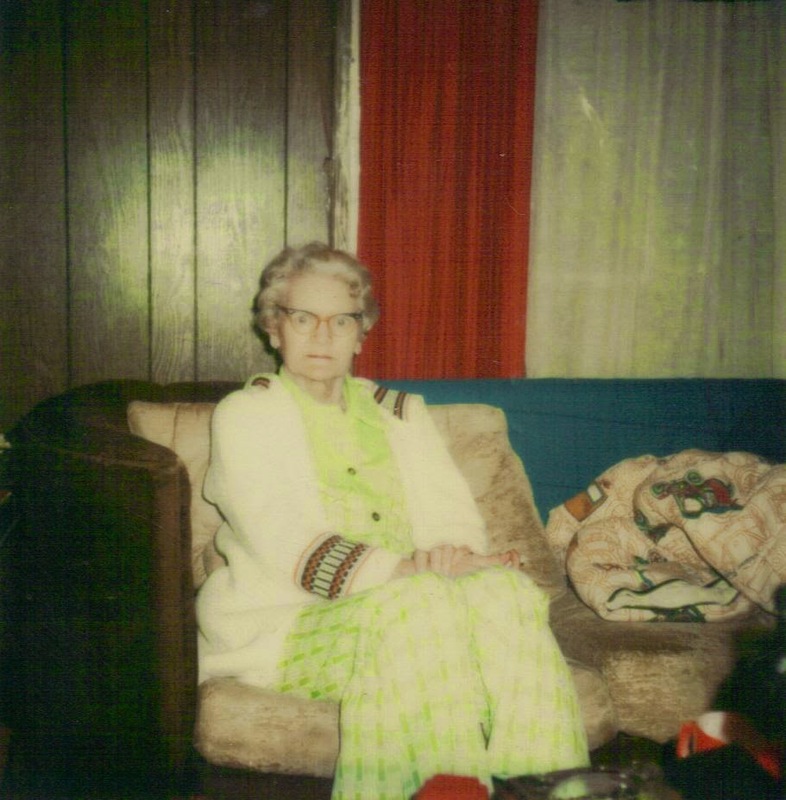 This was my Grandmother Bonnie Hall. My Grandfather had died when I was 13 and my Grandmother continued to raise me after his passing. We had always had Christmas Eve at their home, but she was getting up there in age a little bit and the family slowly started to drift apart. This picture was taken on Christmas in I believe 1978, it could have been 1977 the year my Grandfather passed away, but I think this was 1978. We had went to spend Christmas Eve with my Dad and Jean and my Sister and Brother Pam and Gary who I would later live with after she passed away. This is probably the single person that I miss the most in my life. I've lost a Father, all my Grandparents, Aunts and Uncles and even Cousins. While I do miss each and every one of them, I miss none of them more than this woman. If I could speak to only one lost relative out of my past, this was the one who I spent all my time with. I would love to be called a Mucklehead (what ever that is) just one more time by her. We're getting there. 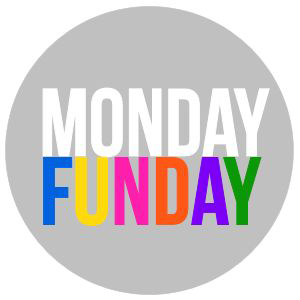 That's two days into this work week and two days ahead of us after this one, so that means that after than noon time hump we're going to start heading downhill towards another fun filled weekend. My niece Val has officially entered the world of iPhone owners as she upgraded her phone to an iPhone 5c yesterday. She got a pink/salmon one and I told her to get an Otter Box which I hope she did. This is her first iPhone, so I made sure to transfer all of my contacts over to her so she can either update or add them to hers. I think she is going to love the phone, plus many family members have iPhones so she will be able to use many of the features with other people. I even introduced her to Facetime yesterday. I was looking at my AARP account and noticed that when we go on vacation this year that we can get a 10% discount at Bubba Gumps. That should save us a few bucks on dinner although we are not going to do the cruise as cheap as we did last year. Last year we had $480 in onboard credits, but there has been no price reductions this year and the prices have actually increased, so the cruise is going to cost us what we paid for it. That's OK though, I'm ready for it. * Well that dreaded Monday is once again behind us. Been there and done that now concentrating on a Tuesday. How about a tidbits. * 3,684 days ago I went from being a Student at West Virginia University to being an Alumnus as I donned my cap and gown and received me Degree. * 2,285 days ago Michelle and I went out on our first date. A dinner at Pizza Hut and a horrible Movie that we have never once watched again, but we're still together. * 1,509 days ago I proposed to Michelle in our back yard. She knew it was coming, so it was no major surprise, but still very special. * 1,046 days ago in front of our closest friends and family we tied the knot at the Marilla Center. * I have about 6,376 days or so to go until I retire, give or take a few. I don't mind waking up and going to work every day, it keeps you busy. * 197 more days left in the year. That's when my end of the year Goodbye 2014 Blog will be written reflecting upon the past 365 days according to my blog. * 191 more shopping days left until Christmas. * 50 days to go until our third wedding anniversary. 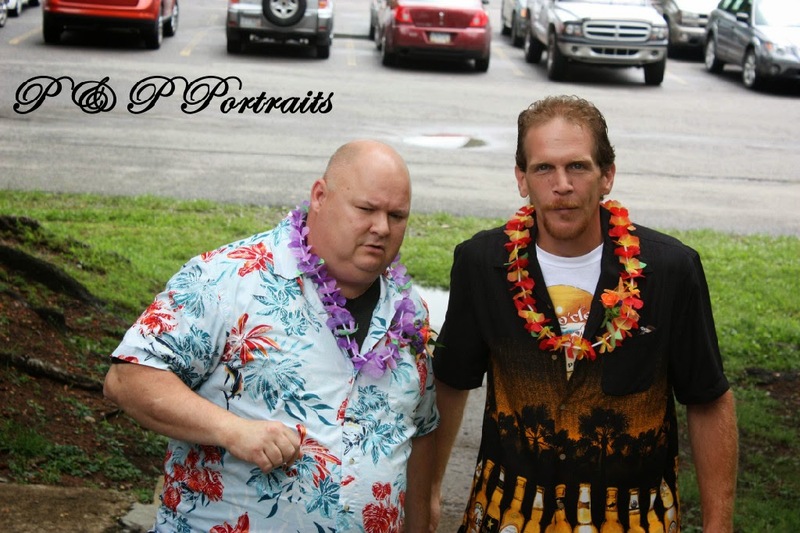 * 36 days to go until the Parrot Heads Jimmy Buffett re-unite in Pittsburgh for the 2014 tour. * 19 days to go until the family Pic Nic at Krepps Park. * Only 4 days to go until SUMMERTIME!!!!! * This is my 3,679th blog post that I have made. I've got about another three months until I hit that ten year mark as a blogger. It's had a lot of ups and downs, misspellings, struggles for content and keystrokes, but I do enjoy it. It's a first person historical perspective of my life. * My niece Val is due for a phone upgrade, I'm telling her to get an iPhone. * Tony Gwynn one of the best MLB hitters that I have ever seen play passed away yesterday. He was only 54. * July 12th Riverside Ministries is having a Car Show at the Church. I know 304dips will be there with some of his wonderful paint work. It benefits the Church's Youth Bible Quizzing team and they are going to have BBQ Chicken Dinners available for $8.00 if anyone wants some good fresh BBQ Chicken. * Sadness occurred over the weekend when former Pittsburgh Steeler and 4 Time Super Bowl Winning Coach Chuck Knoll passed away. RIP Coach. * Looking like it's going to be hot, muggy and rainy all week. I'll take that anytime over the alternative (Snow). All good things must come to an end and that includes those fun fill days that we enjoy and call weekends. 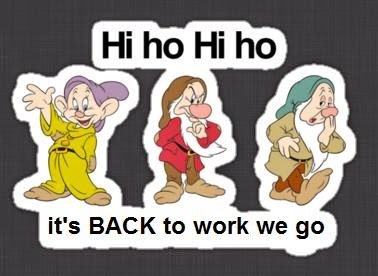 Now it's time to stick the noses back on the grindstone and get back to work for another week. You can't have a Friday unless you get through Monday. Yesterday was a nice relaxing day for us here. Smoked some ribs on the grill and did a little bit of running around with our shopping and preparing everything we need for the work week. This LoseIt ap that I have been using is really amazing, I'm down 22 pounds since we started tracking everything. I'm on a 1,600 Calorie a day diet and I always come in significantly under that. If anyone wants to lose weight and will take it serious, this is amazing. You just need to know what your daily caloric intake needs to be and adjust accordingly. You need to be 3500 calories under the amount of calories you need to maintain your weight to lose a pound, of course that is not all in the same day, if you are 500 calories under your what it takes to maintain your weight for a week, you will lose a pound. There is no magic pill, you just have to maintain proper caloric intake and exercise. I was going to make this a serious post, but maybe it was time for a little bit of humor since my Father left us 15 years ago. I was going to do another tribute blog, but decided to do one a little more light hearted this year. 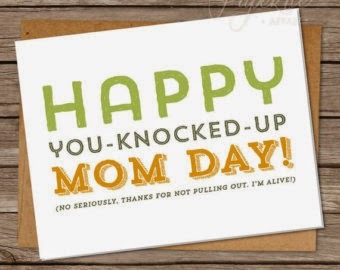 You Knocked Up Mom Day like Mother's Day has it's origins in North Central West Virginia, but credit goes to Spokane Washington even though they started to celebrate it AFTER Fairmont, where the first Fathers Day was observed. I was fortunate to have a great father, he was always there for me and has influenced my life with morals and ideals that still influence me to this very day. My Grandfather was my first Father Figure in my life, my Papaw was the greatest Papaw in the history of the world, but once he passed my own Father who was more of a big brother to me had quickly filled the void. I honor both of these great men on this day. Here I sit once again in a quiet household, Hayley is staying with her boyfriend and Michelle is still suffering from that losing bout with the Sandman last evening. I'm up early collecting my thoughts and watching Enemy of the State on Cinemax (Great Movie). We get ourselves a couple of house guests for the week ahead. 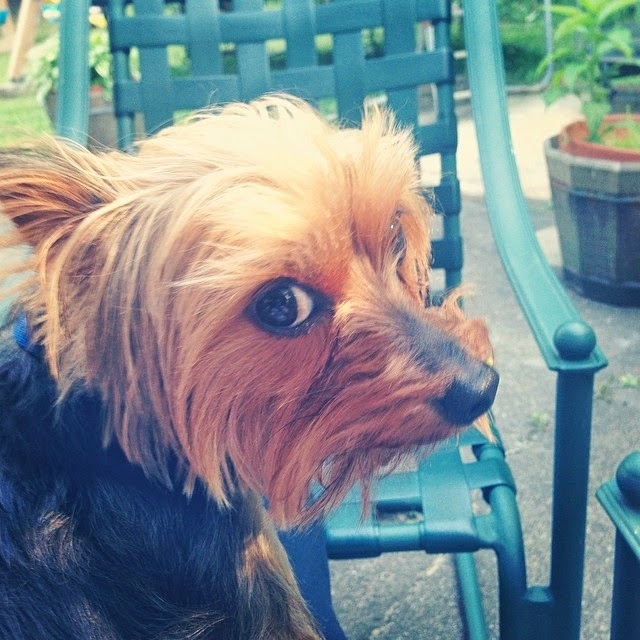 Rocky and Lilly will be here very soon as Michael and Ashley are heading out on vacation for the week. My little buddy as I so refer to him will probably be here within the hour and the party will start. I managed to get most of Hayley's information off of her old computer. I took it into work and we plugged the Hard Drive in so we could recovery the data. She had a lot of music, but that can be replaced but the pictures and documents had only one copy and that is what we targeted. Today's agenda is going to include a trip to the rails to trails and then possibly a trip to the Morgantown Farmers Market. We'll plan out our weeks menu today and maybe shop accordingly or we'll influence our menu based on what we can find. We did get some really nice and large portobello caps last night at Sam's and we're looking for something to do with them. 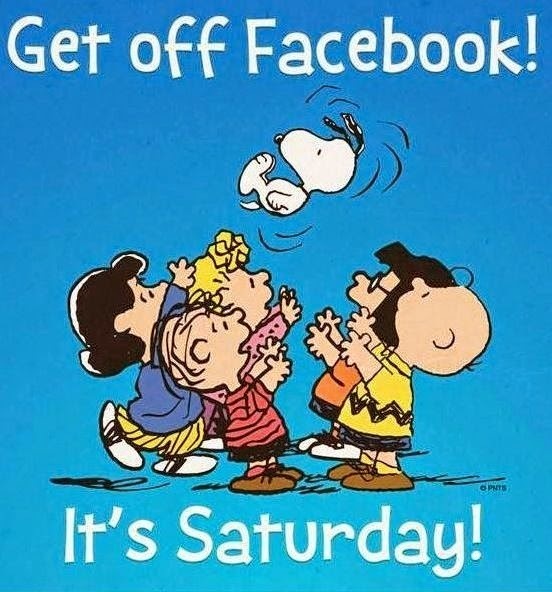 Have a great day, it looks like Mother Nature is going to get it right for a third weekend in a row. There is no Family Fun Festival this evening, it will return on July 11th with Despicable Me 2. If you would like to see the movie, put it on your schedule and plan on being there. These events are a whole lot of fun for the kids. No big plans on the agenda for us this weekend off the top of my head. It is supposed to be nice this weekend weather wise, maybe a trip to the rails to trails will be on our agenda. 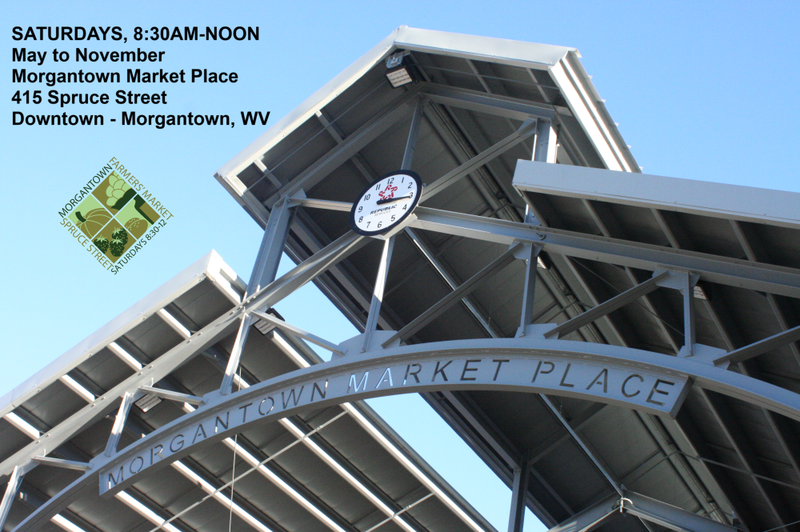 One thing we could do is finally make it to the Morgantown Farmer's Market for once this year. We talked about stopping by last week, but we needed to run and get a few things at Walmart for the birthday parties last week. Mom's computer is fried. My guess is that there was some kind of an electrical surge that went through and pretty much fried the motherboard. When I went and looked at it all I could say was it was F'd. I took a pen drive with me with multiple versions of linux, but I could have left it at home as it wasn't a hard drive issue. Never seen one this screwed up. We took care of it, she's now got a laptop with Windows 8 and a touchscreen. She should be good to go for a while. Once a week I like to take a little bit of time out and look through all of the pictures that I have gathered through the years. Pictures that I have either taken myself, scanned from a hard copy or just stolen from someone else. It is a nice large collection that I now have both upgraded my capacity to 4 Terrabytes and added redundancy (That's another 4 Terrabyte Drive with similar information) to protect all of those precious lost moments in time. This is one of my favorite blogs of the week for two reasons, one it's getting closer to the weekend and two I get to take timeout and reflect a little bit. It's not always an easy or a hard task, but it is always enjoyable. This weeks picture was an easy one even thought I stole it from Ashley. This is my little buddy (who will be coming to stay with us for the next week) Little Rock of Love or Rocky as he is really called. She snapped this picture of the little ball of energy last week and I just had to steal it and share it. Rocky meets me every morning and evening to say hello with his sister Lilly (I think they come because I give them treats) and greet me. This is the little guy who got ran over by a car this past winter, but he has recovered and is as full of energy as they come.He is going to have surgery this fall, but not until after the Summer is over with so he can have fun and frolic while the weather is nice. I have yet to meet anyone who just did not get instantly attached to this puppy. When Michelle's friend Shawn came to visit us from Iowa last summer, he wanted to take him back home with his as he was so much fun. Have a great day, time to give to see my buddy and give out some treats. Well that is two days down and now if we look up over that noontime hump, we can see another weekend just on the other side of a photo flashback. It's all downhill heading toward another fun filled weekend. Some people are having more fun than others at work, as you can tell by my wife in this picture. 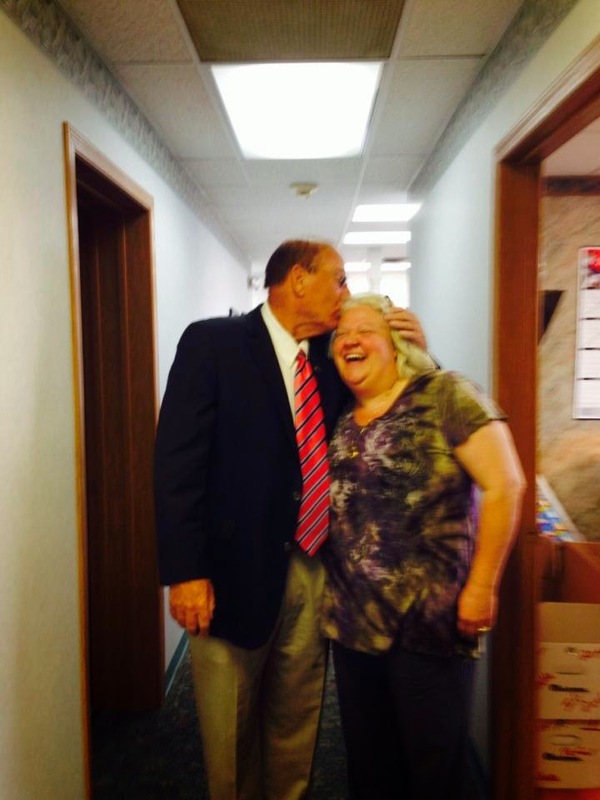 Former Marshall coach Bob Pruett stopped by her office once again for a photo opportunity. He kissed Michelle on the head and told her to tell me that she is now a Moo Tech fan. I think it has made her day to say the least. He actually wants to go out to dinner with us some evening with his wife. As a WVU fan and Alum it would be my honor to remind this great coach that WVU owns Marshall in this series 12-0. I did have a Doctors appointment yesterday and my Doctor was not available for the appointment, the Doctor I saw in his place turns out to be Gerald's niece Kristen. I thought the name sounded familiar, so I called mom when I got back and she knew exactly who she was. Small world. Well it looks like we are going to once again be empty nesters, Hayley and her boyfriend Josh have found an apartment near Morgantown High School and will be moving there on July 1st. * Monday is now behind us and we are looking straight towards a Tuesday, can't think of a better reason to do a tidbits. * It has been 3,677 days since I listened to Pomp and Circumstance while accepting my degree from West Virginia University. Seems like yesterday. * 2,278 days ago I had the pleasure of going out for a night on the town with a special lady. * 1,502 days ago I made that special lady a very special lady as I proposed marriage. * 1,039 days ago in front of our closest friends and family, that very special lady became Mrs. Hall. * I have about 6,383 days to go until I retire, give or take a few here and there. * 198 days to go until that magical time of the year when families get together and celebrate that magical time of the year for Christmas Eve. * Only 89 more days until Michelle and I hit the Atlantic Ocean once again and make our way towards the Caribbean. * In 57 more days that special lady of mine will help me celebrate our third wedding anniversary together. * Jimmy Buffett will be returning to Pittsburgh in 43 more days to perform his yearly concert. We will once again be in attendance and ready to party. * 26 more days until the family Pic Nic at Krepps Park. 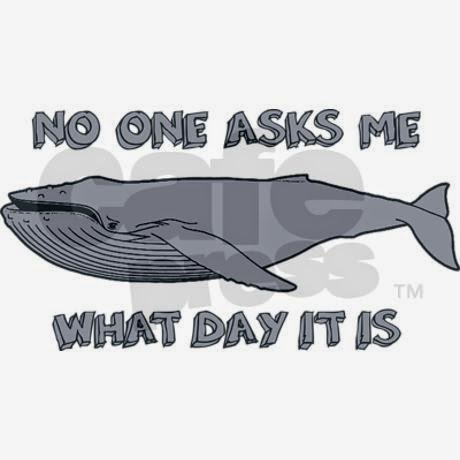 Hopefully it will be a day filled with fun, food and family. * Only 11 more days till SUMMERTIME!!!!!!! * This is my 3,672nd blog post since I started writing a blog nearly ten years ago. * Speaking of the Pic Nic, it's coming up on us here soon and we need to start to get organized. * We are baby sitting the upstairs puppies this weekend. That means my buddy the "Little Rock of Love" and Lilly will be here all next week. Mike and Ashley are going on vacation to the beach....I think. * Michelle texted me yesterday and said that former Marshall coach Bob Pruett was in her office. She said he was a very nice man even though he coached Moo Tech. * We finally started watching season 2 of Orange is the New Black on Netflix over the weekend, my sister Pam has finished the entire second season already. We'll catch up. All good things must come to an end, and like it or nor for us Monday through Fridayers that includes the weekend. It's time to stick our noses back on the grindstone for yet another fun filled week of work. The birthday party yesterday went well, we were able to avoid the storms and pull off the party before the rain did set in. Erica and Josh both had a great day and received some pretty nice gifts. Now I'm looking at the week ahead and realize I have a couple Dr's appointments this week. One with my regular physician and one with our dietitian later in the week. I will say both Michelle and I were doing much better than expected on our diets. We both thought that the low calorie diets that we had been given would be hard, but it's not has hard to do as you would think. You just have to eat healthier and that is honestly not a hard thing to do with the assistance of the Lose It Ap. I did buy another external Hard Drive Yesterday, I don't like the idea of not having some redundancy with all the pictures that I have taken or scanned through the years. So now I have the 4TB MyCloud Drive, a 4 TB WD drive that backs everything up and a 1TB WD Drive for system backups of my 1 TB Hard Drive. That's 10 Terrabytes of storage and redundancy. Here I sit once again in the early AM in a quiet household, I'm the first one to recover from a losing battle with that dreaded Sandman once again but then again Hayley is still out celebrating her birthday from last night. So now we have one party (if that is what you call it) down and one to go. Today is Erica and Josh's Birthday Party at Val's place. Always one of the highlights of the summer, Val puts both kids birthday's together and has one big Birthday Party for the kids. I'll be there once again with my Camera capturing as many memories that I possibly can. It'll also be the last time before the big family Pic Nic next month that we will all get together so we can do a little bit of planning. We are less than a month away from that event, so it will be nice to get together and get some ideas for that event. I would like to take this opportunity to wish my beautiful step daughter Hayley Dawn Collins a very Happy 21st (you made it) Birthday today. A very special young lady in my life. It seems like it was just yesterday that we were taking you out for Dinner and to see Kung Fu Panda for your 15th Birthday or having your Sweet 16th here. That little girl has now grown to the point where you stop counting birthdays and start celebrating anniversaries of birthdays. Hayley and Josh I'm sure have a full day planned for her, and I'm also quite sure that her buying her own alcohol for the first time legally are also in todays plans. If you see Hayley today, make sure you wish her a very Happy 21st Birthday. Here I sit once again in a quiet household, I'm the first one to recover from that losing battle with the Sandman last night, although I was also the first person to lose a battle with the Sandman last night. I'm up early, but not as early as I usually am watching Bad Grandpa on Amazon on demand (we buy all of our movies from there). Well it looks like the weather is going to be great today, so we're probably going to hit the trails this morning for some exercise and a nice walk this morning. I'm not sure what is on the whole days agenda, but I'm sure it will be some running around rather than just sitting around the house today. I've read about the passing yesterday of a High School Classmate. Someone who was so full of life and had everything going for him. It makes you realize life is just way too short, live it to its fullest while you are here. RIP Marc, you will be missed. Well this is going to be a Birthday Weekend for Michelle and I. Hayley turns 21 tomorrow, so that will be one Birthday and Val is having Josh (July 29th) and Erica's (June 19th) Birthday Party this weekend at her home. I'll be there to once again grab a number of pictures so that I can use them sometime down the road on a Photo Flashback Blog. Michelle had to have a root canal done yesterday on one of her teeth. They have scheduled to put a crown on it sometime in the near future, but as of the time I author this Blog post I do not know when. She tried going back to work yesterday, but I guess she wasn't feeling that well so she went home to rest. Tonight's agenda is probably the same as any other Friday night, dinner and then a trip to Sams Club. Not exactly the most exciting of things to do, but we enjoy it and allows us to stay stocked up on whatever we may need. If you are looking for some cheap (as in free) entertainment tonight, BOPARC is starting their Summer Movies at Hazel Ruby McQuain Park tonight at 7:00. The movie Frozen will play on the big screen, so grab a lawn chair and your favorite snacks and drinks and head on down. The movie will start at 9:00 PM but they will have the WVU Healthcare Bounce House from 7pm-9pm. Once a week I like to take a little bit of time out and look through all of the pictures that I have either taken, scanned or stolen from the internet over the years. I like to choose just one of those precious lost moments in time and post it up and write a little blog about it. Sometimes this is a pretty easy task and sometimes you really rack your brain to come up with something, it is however always a whole lot of fun. I do have to admit, that after doing this for a while you always wonder if you have used that image before or not. Pictures that you know you like, but are worth repeating just in case you haven't done them before. This weeks picture is one of those pictures. This one always has been one of my favorites, it was taken in the late 60's, I don't know the specific year, but it is a picture of me and the man who was a great big influence on my life. 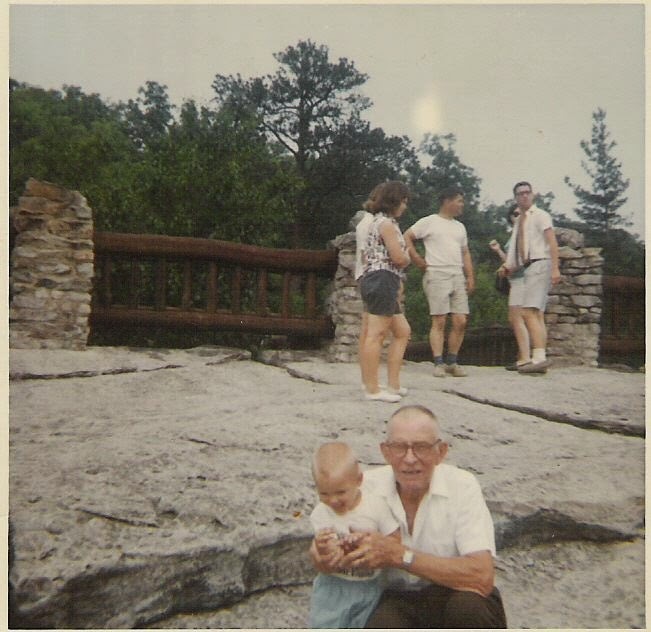 Me and grandpa Hall out on Coopers Rock. The man who I still honor to this day and am even proud of the fact that I graduated college on the 27th Anniversary of his passing. May 16th will always be a day I remember for one of my life's high points and one of its low points. Check out those funky clothes of those behind us. I do remember I had a shirt that said "I'm a Little Stinker" and had a button you pushed to make it squeak that day. How I remember that fact, I'll never know. I would like to take this opportunity to wish the greatest brother in the whole wide world a very Happy Birthday today. I am the luckiest man on the earth, because that greatest brother in the world is my little brother Gary. A man who was also the best man at my wedding. Gary is a Contractor so he is always working and you never know when you are going to see him or when you will not. I'm very proud of him and what he has went out and started to build, I'm sure my Dad would also have been quite proud of the man he has become. Happy Birthday Little Brother, I hope it is filled with love, fun, joy and great memories. That thing that we call a weekend is getting a little closer. 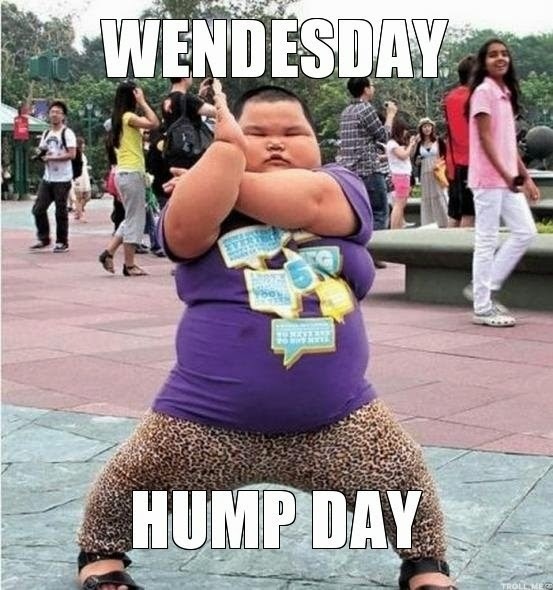 We're almost half way there and today once we get up over that lunchtime hump, it'll be all down hill from there. Now lets just roll on down that hill and get passed the Photo Flashback and look towards another Big Ole Hairy one to start a weekend. This weekend is going to be what I am going to have to call a Birthday Weekend. My Lovely Step Daughter Hayley will be turning that magical age of 21 on Saturday. I call it magical because that is when you stop counting birthdays and refer to the Anniversary of this day. On Sunday my niece Valarie will be having a duel birthday party for both of her kids Erica and Josh at her home. That's always one of the high-points for the summer, one that I am always guaranteed to get a few pictures. It is a pleasure to watch all of the Great nieces and Great nephews grow up, much like it was when I watched their parents grow into mature adults. My where has the time gone, it seems like it was just yesterday they were the children. Michelle had a little bit of a Dental Emergency yesterday, she went to her dentist after her tooth hurt real bad after a sip of water. Turns out she is going to need a root canal and then a crown for her tooth. Good thing we have pretty good Dental Insurance as well. * Goodbye Monday and Hello Tuesday. Tidbits? * It has been 3,670 days since I fulfilled a dream of mine and Graduated from West Virginia University. I always said if I ever hit it rich I would go back and finish my education. I hit it poor, so that was my inspiration. * 2,271 days ago I took a special lady that I had known a few years earlier out on night on the town. Actually it was Pizza and a horrible movie, but it will get better as the years go by. * 1,495 days ago I asked this special lady to be my wife. 4:00 in the morning out in the back yard I got down on a knee and popped the question. She wasn't surprised. * This is our 1,032nd day of Marital Bliss. * I have around 6,390 days or so to go until I retire, give or take a few I'm sure. * 211 more days left in the year, I still have time to add content for my end of the year blog, but it is developing quite nicely so far. * Christmas eve is in 205 more days. I have a feeling it will be Me and Michelle running to multiple locations once again. * 96 days to go until we set sail yet again for the Western Caribbean. We've made it over half ways since we officially booked it, now we can really start to pay attention to the countdown. * Our third Wedding Anniversary is only 64 more days away. * 50 days from now we will be assembling with the rest of the Parrot Heads in Pittsburgh to once again party it up and listen to Jimmy Buffett and the Coral Reefer Band entertain us for an evening. * 33 days to go until the big Family Pic Nic at Krepps Park. Hopefully this can be a time where everyone comes together and enjoys the day. It's the kind of day where I would love to have both of my camera batteries go dead from taking pictures. * We are 18 days away from SUMMER!!!!! * This is my 3,663rd Blog Post that I have written. Not too bad for something I just wanted to try out. Talk about documenting your life on the internet. * Looking ahead at the Forecast, could Mother Nature be getting it right once again? It's early, but it appears that it may be that way. * Kaiden graduated from Pre-K yesterday, it's just getting started. * Erica and Josh both celebrated their end of the school year celebration yesterday as well. * I guess this means school is either out, or about to be out for Monongalia County. If it was not yesterday, I'm sure it will be one day this week. Depending on how many snow days they have to make up. * We did log an Earth Cache this past weekend at Blackwater Falls. I've topped last years total already, but that wasn't that hard. I'm almost ready to go into double digits for the year and that's pretty sad. Michelle, we need to get busy. * Found a great new ap and website that helps you keep track of your caloric intake, actually all the credit goes to Michelle. The site is called Lose It and it syncs up to our iPhones. * I've been a slacker and done absolutely zilch on the Hall Family Tree in the past few weeks. Need some bad weather (Just kidding). All good things must come to an end, and that includes those fun filled things that we love so much and refer to as weekends. Now it's time for us to stick our noses back on the grindstone for another fun filled week of work. These are the things we do that allow us to live the lifestyles we live. I do have to give credit to Mother Nature for this weekend, after raining all last week, it was absolutely beautiful this weekend. It was filled with sunshine, and just warm enough weather that you could do about anything you wanted to do. The funny thing is, that is calling for rain all week, so we give thanks to Mother Nature for giving us this wonderful gift and waiting until we were back to work to start raining. We have an outdoor porch swing with a canopy, I think we have enjoyed it more this weekend than we did all last summer (it was always raining). It's nice to sit out there in the evening, much better than sitting on a computer and other activities that cause us to let life pass us by. Don't get me wrong, I love the internet, but I hate being cooped up much much more. This is my time of year, so it's time to live and enjoy it. I have a wonderful wife and we had a wonderful weekend. We traveled, we swung on our swing, we hiked on the trails and we actually ate more healthy this weekend than we have in some time. I hope to have a number of more weekends like this one. Well here I sit once again in a quiet household, I'm once again the first to recover from a losing battle with that dreaded Sandman last night. I'm up early watching the Sixth Man on HBO and collecting my thoughts for the day. Well our road trip yesterday turned out to be a trip to Blackwater Falls State Park. I ended up going the wrong way and not paying attention, thankfully we had the GPS to put us back on track. I wasn't thinking and was heading towards Elkins, but the trust GPS put us back on track. I put all of our pictures from yesterdays adventure on Facebook. It was a great time, we had a little cookout before we went down to the falls and had a leisurely return home on the twisty twindy road that is Route 50. It made for a good day trip and we both had a whole lot of fun and enjoyed a day of fresh air, sunshine and relaxation away from everything like stop lights and excessive traffic. Today it's back to our normal routine before we return to work tomorrow.